@Eagle4 a écrit: Max lui ne met pas de casque quand il a quelque chose à dire à un autre pilote. Jorge appuie la ou sa fait mal. C'était pasune des forces de Rossi de déstabiliser ces adversaires avec des déclarations bien senti? Jorge est bô et sera comme Max une nouvelle fois sacré champion cette année. If sales of merchandise are anything to go by, then the move was definitely a success, MotoGP circuits coloring red as Rossi fans stocked up on Ducati gear, the red still tinged with Rossi's traditional yellow. But a look at the results sheets tells a different story altogether. Though the Italian is 5th in the championship standings (and just 2 points off 4th), Rossi has consistently crossed the finish line between 25 and 30 seconds after the winner took the checkered flag. So far, Rossi has taken just a single podium - arguably gifted to him, with Dani Pedrosa being taken out by Marco Simoncelli, and then Simoncelli being punished with a ride-through - and has found himself in the battle for 5th or 6th. By any measure, Rossi's move to Ducati must be counted a disaster, the combination a massive disappointment to fans, followers and even fellow riders. Unsurprisingly, there has been fevered speculation about the cause of the problems, and whether it is down to the rider, the bike, or the combination of the two. Rossi fans point to his record, and the fact that he won a race in October of 2010, even while suffering with a damaged shoulder, only fixed after the end of the season. Yet Ducati fans, along with a contingent of Stoner fans, point out that Stoner was able to win on the previous incarnation of the machine (the GP10 the Australian raced last season was very similar, with one or two exceptions, to the GP11 which Rossi started the season off on), and so there can't have been that much wrong with the machine. Others postulate that it is not so much a single factor, but rather that the combination of Rossi's high-corner-speed style and the Ducati's flaky front end that is to blame, the Italian unable - or unwilling - to adopt Stoner's excessively aggressive corner entry style which allowed him to tame the Desmosedici. So where does the truth lie? What is really wrong with the Ducati-Rossi combo? Is Rossi over the hill, or did Stoner make the Ducati look good, or is Rossi just not capable of adapting his style to the tricky Desmosedici? And if it is the bike, can Rossi's wily veteran crew chief Jeremy Burgess cure what ails the Ducati? We will go through the possible causes of the problem one factor at a time, but first, it may be helpful to identify exactly where the problem lies. Why is that neither Valentino Rossi nor Nicky Hayden have been able to get the Desmosedici to work? It all comes down to one thing: front-end feel. "The problem is in braking and entry," Rossi said at Mugello. "I don't have enough feeling from the front for corner entry like I want." The Ducati simply is not returning enough feedback from the front tire to the rider, nor providing enough grip from the front Bridgestone tire. "We have a lot of problems to put enough temperature into the tires," was Rossi's verdict at Assen, where very cool temperatures prevailed. At both Assen and Silverstone, Rossi had been forced to use the softer compound tire during practice, which helped by coming up to temperature a little more quickly, but as the soft front was only good for a few laps, it was never going to be an option for the race. The hotter temperatures at Mugello helped a bit, giving more feedback from the front, but still Rossi remained eight tenths of a second slower than the leading group. Summarizing both Rossi's and Hayden's descriptions of the problem over the first half of the season, the front end of the Ducati feels vague and does not provide sufficient feedback, leaving both Marlboro Ducati riders with a lack of confidence in the front end. And the underlying cause of the lack of feel is the difficulty of getting the ultra-stiff Bridgestone tires up to temperature. The biggest variable which has changed between 2010 and 2011 is the departure of Casey Stoner and the arrival of Valentino Rossi. Though Rossi is now riding a heavily modified machine (the GP11.1, as it has been dubbed, is a destroked version of the 2012 Desmosedici, its capacity reduced to 800cc to make it legal for 2011), the bike he rode until Assen was not much changed from the bike Stoner left behind at Valencia in 2010. The bike had a modified triple clamp, a slightly different swingarm, and a slightly revised front chassis. The biggest changes have been in the field of electronics, Rossi and his crew helping to provide a much more user-friendly engine response package, introduced after Estoril. So if Stoner made the Ducati work, then surely the problem must be with Rossi, right? Though that might appear to be the logical conclusion, that grossly oversimplifies a complicated situation. Just 9 months ago, with a weakened shoulder that left him struggling, Rossi was still capable of winning races and scoring regular podiums. He was poetry to watch, flowing over the Yamaha M1 and able to put it just about where he wanted. In the 11 races after returning from the leg he broke at Mugello, and still struggling with the shoulder injury he picked up in a training crash in April, Rossi was on the podium 7 times, including 1 win. Riders simply do not lose that kind of speed over the winter break, not unless they suffer a career-threatening injury. From the moment he swung his leg over the Ducati, Rossi was immediately miles off the pace. He ended the two-day test 1.7 seconds off the pace of the fastest man, Jorge Lorenzo. Three days earlier, in the race, Rossi's fastest lap had been just a few hundredths slower than Lorenzo's. Worse still, Rossi looked nothing like himself on the bike. Several observers commented that it was as if someone had sneaked into Rossi's motorhome, stolen his leathers and helmet, walked in through the back of the pits and onto the Ducati without anyone noticing he was not Rossi. At that first test in Valencia, Rossi looked like a journalist riding the bike, someone far less comfortable or able easing his way around the track. Rossi was not the only rider to undergo an overnight transformation. Loris Capirossi jumped off the Rizla Suzuki and onto the Pramac Ducati and went nowhere, while Randy de Puniet has been transformed from the man who regularly scored top 6 results on the LCR Honda to a rider who can barely make it into the top 10 on the Pramac Desmosedici. With the Ducati's history of destroying riders' reputations - along with their self-confidence - Rossi is just another casualty in the long list that started with Marco Melandri. The startling difference between Rossi's times from this year and those from last year is one clue that the problem is not with the rider. At Laguna Seca, where comparable temperatures prevailed between the 2010 and 2011 events, Rossi was 14 seconds slower this year than on the Yamaha. At the 2010 event, Rossi was still using crutches, the US round being only his second race since returning after breaking his leg at Mugello, some 8 weeks' beforehand. But the key piece of evidence that the problem is the bike and not the rider is the times of Nicky Hayden: the American was also 14 seconds slower at Laguna in 2011 than he was in 2010. So it appears we can safely rule out the problem being the rider. And if it isn't the rider, the problem must lie in the bike. Indeed, speculation and conjecture about where the problem lies have been more intense than ever this season, with everyone and their mother-in-law apparently having an opinion. The ideas around the Ducati's shortcomings seem to fall into three schools of thought, two centering around the chassis and another focusing on the engine, with the theories about the chassis being by far the most popular. The favorite culprit is the use of carbon fiber to build a frame, the properties of the material being blamed for the lack of feel in the front end. The layout of the chassis is the next favorite among the pundits, the short subframe which joins the steering head to the engine being fingered as too small to provide sufficient flex for the front. And the third, but far less favored option is the layout of the engine, the characteristic L-shaped 90° V4 forcing too much weight towards the rear. Let's go through these options one-by-one, and examine how much blame should be attributed to each. Before we look at carbon fiber, a quick word on motorcycle chassis. Once upon a time, a frame was just some tubing that held the engine in place and connected the steering head to the swingarm. As tires improved and engine outputs increased, the forces involved in braking and accelerating started to overwhelm the tubular steel chassis, and frame builders started to make their frames stiffer. In the 1990s, chassis builders started to encounter the opposite problem: as their frames got stiffer and stiffer, the bike started chattering and vibrating, making handling terrible, especially when leaned over, when the suspension of a bike ceases to work, being in the wrong plane. And so the concept of flex was introduced, adding sufficient flexibility to allow the bike to absorb some of the bumps while leaned over, but still stiff enough to keep the chassis stable in a straight line and under braking. Since the late 1990s, and especially since the four-stroke era began, a huge amount of work has gone into engineering in exactly enough flexibility in specific areas, while retaining the stiffness in the planes where it is needed. As tuneable flexibility has become increasingly important, the attractiveness of alternatives to aluminium has also grown. Traditional aluminium has the benefit of being light and easy to work with, but as MotoGP chassis designers push the limits, they also run into a few limitations. Engineering in flex is a matter of designing chassis elements with a specific thickness and shape, but the underlying properties of aluminium mean that at some point, achieving the precise amount of flexibility required means sacrifices strength. The way to get around this problem is by making elements longer, allowing a mass (usually, the mass of the engine) to use the greater leverage provided by a longer element (such as an engine spar connecting the engine to the main chassis beam) to provide the flexibility without sacrificing rigidity. When the rest of the world switched from perimeter steel tube frames to aluminium twin spar frames, Ducati took a different but still ingenious approach. Instead of wrapping the engine in aluminium box section, Ducati welded up short sections of light steel tubing to create a trellis frame. The advantages were that the chassis was relatively easy to tune, by changing the diameter and position of the individual tubing sections and redistributing the load and the flexibility, and Ducati persevered with the design for six years until they dropped it in favor of carbon fiber. The downside to the trellis frame is that the trellis - a series of joined triangles - limited the amount of space available for the airbox. All those short, straight tubes meant the airbox had to be shoehorned in, restricting the airbox in both size and shape. Furthermore, the disadvantage of having the frame constructed from twenty or so short sections of steel tubing is that those twenty tubes require forty welds to join them all. Getting weld strength to a precise tolerance is a very tricky art at best, and the more there are, the more chance of variation. While still at Ducati, Casey Stoner said that even when he had identical setups on his two Desmosedicis, they would never feel exactly the same. Paddock rumor suggests that variation in stiffness between two supposedly identical steel trellis chassis could be large - as much as 15% - due in part to the problems of reproducing so many welds and so many parts to completely identical specifications. Carbon Fiber - Too Stiff For Racing Motorcycles? Hence Ducati's decision to go for carbon fiber (CF). The advantages over steel trellis are manifold: as CF is a composite, it can be easily molded to create whatever shape is required; its flexibility and stiffness can be almost infinitely tuned using a combination of fiber direction and thickness; it is incredibly light, with much greater strength than metals; and the stiffness and strength can be tuned to respond differently in different axes and directions, a more difficult trick with metals. Ducati's main reason for choosing CF was the combination of stiffness, low weight and the ability to form the material into the shape required. The Desmosedici's forward chassis section functions as a combined airbox and subframe: the subframe is required to be light and strong, while the airbox needs to be large enough to feed the Ducati's bellowing intakes as its 800cc motor spins at 20,000 rpm. By carefully calculating the desired stiffness in the different planes and axes - stiff enough to remain stable under hard braking, supple enough to flex from side to side to provide some suspension over bumps at full lean, all the while resisting torsion, or the urge to twist - the required combination of the number of layers of carbon fiber weave and the direction in which they are laid can be worked out. Once assembled, the subframe can be cured in an autoclave and sent to the team. Data returned from testing can then be integrated into the models used to create the existing subframe design, and a new iteration produced in the same way. The claims by many that carbon fiber is too stiff to use in a motorcycle chassis can be put down to a common misunderstanding. CF can be made as stiff or as flexible as the designers want it to be, by varying the thickness and direction of the fibers in the weave. Its use is common in fishing rods, and for a demonstration of just how flexible CF can be, check out this video of a CF fishing rod being tested to breaking point. The problem is not that CF is too stiff, but that the feedback it provides differs so completely from conventional aluminium. The property most often quoted is hysteresis, which in this instance, refers to the rate at which absorbed energy is returned. One of the benefits of CF is the fact that it can be made to damp vibration, its hysteresis meaning that the energy absorbed from an input (such as striking a bump) is released in a much more controlled fashion. Tap an aluminium tube and it rings like a bell; tap a CF tube and it emits a dull thud. This is a property that Ducati had hoped would help them solve the problem of chatter (or extreme vibration over bumps) but it had an unintended side effect. Just as with the original attempts at using carbon fiber for chassis, starting with the Cagiva back in 1990, the damping also removes some of the feel from the front end. When used to build swingarms - as Aprilia had been doing for their 250cc racers for several years - this damping helps remove unwanted vibration, but at the front of the bike, that vibration also contains valuable information. As Guy Coulon once explained to me on the subject of unconventional front suspension systems, what is required of a racing motorcycle is that the information from the tarmac should pass directly into the rider's brain with as little interference or loss of data as possible. Any system which removes or alters that information means that the rider has to learn to interpret the feedback almost from scratch. All of the experience gained in his many years of racing is of little value in interpreting what he is feeling. This is what caused the Cagiva to fail back in the early 1990s. The riders, brought up on a generation of steel and aluminium chassis, simply could not understand the feedback they were receiving from the machine. And this seems to be at least one part of the problem with the Ducati Desmosedici: the carbon fiber subframe connecting the front forks to the front of the engine may be damping the vibrations too much, reducing the amount of information traveling from the front tire up into the rider's brain. Alternatively, it may be returning too much information, providing more feedback than most riders are used to receiving. Filtering out this new (and not necessarily useful) information may be what is confusing the riders about the feel. As we said earlier, the underlying problem of the Ducati is the difficulty the riders have in getting the front tire up to temperature. The stiffness of the CF chassis may not be the problem here, but the feedback from the chassis could make it harder for the riders to push the tire hard enough to start working. 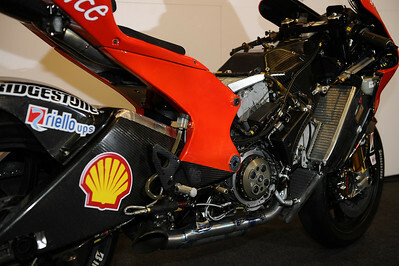 So is the choice of carbon fiber the main cause of Ducati's problems? Looking at the theoretical benefits of the material it is hard to say that it is. There could be an issue where the feel of a CF chassis is sufficiently different to traditional aluminium that it is hard for riders with many years' experience of metal frames to interpret and understand. But with Rossi known more for his adaptability than for his rigid adherence to a single style, this does not seem like an insurmountable candidate. So let us examine the next candidate. If it's not the material, perhaps it is the amount of material being used. The major difference between the Desmosedici and the Yamaha, Honda and Suzuki is not so much the use of carbon fiber, but rather the use of the engine as a stressed member of the chassis. Where the Japanese machines have long aluminium beams joining the headstock to the swingarm, the Ducati has a short, boxy section bolted on to the cylinder heads of the two banks of cylinders that compose Ducati's 90° V4. The mounting is as direct as possible, with the mounting points placed near to the headstock. The advantage of this construction is that it uses the stiffness of the engine casings as an integral part of the chassis, and allows the chassis to be made much lighter. With both the front subframe and rear swingarm attaching directly to the engine, there is little superfluous material around. This makes it possible to keep the bike very narrow (there is no perimeter frame snaking around the engine), as well as using the stiffness of the engine to maintain stability under braking. Again, by integrating the airbox into the subframe, another extraneous part can be discarded and the weight of the bike kept down. Criticism of the design focuses on the shortness of the parts involved, and the complications that adds in obtaining the desired degree of flexibility. The words of Masao Furusawa, the design genius behind Yamaha's M1, are often cited, about the need for the chassis to bend like a tree. Longer chassis sections create a longer lever, and allow flexibility to be created much more precisely. To illustrate the argument, take a long, thin object - such as a cane, or a wooden ruler - and try to bend by pushing down at both ends. The object should bend like a reed. Now put your hands just a couple of inches apart and try to bend the object again: it's almost impossible, at least not without snapping the object. The long engine mounting spars on Yamaha's M1 are a case in point, their length aimed at absorbing bumps while the bike is leaned over. The counter-argument to this criticism is that the use of carbon fiber makes using longer chassis elements unnecessary. The very programmable nature of CF - the mixture of layers, direction, resin and curing - means that it should be possible to exactly replicate the effect of a long aluminium chassis spar merely by varying the nature of the carbon fiber used. Long sections may make things easier when building frames in aluminium, but carbon fiber dispenses with all that. Though CF is undeniably an incredibly versatile material, there may still be some merit in the criticism. Having such a short subframe also means that the engine has to transmit a lot of the load. The engine is significantly stiffer than the chassis - it has, after all, to contain and dissipate 230-odd horsepower and deliver it to the back wheel without shaking itself apart. What this means is that the entire chassis assembly consists of two separate parts of completely different stiffness. The more flexible front subframe - complete with engineered flex to aid in absorbing bumps at extreme lean angles - is connected to a rigid engine with almost no flex at all. The central part of the Desmosedici has no flex, while the front subframe and the rear swingarm do. On a more traditional twin spar chassis, the loads are carried from the front of the bike to the rear through aluminium beams connecting the headstock to the swingarm. The CF subframe may be engineered to provide the same amount of flex as a traditional twin spar, but the two ally beams on the twin spar flex much closer to the center of the bike. Instead of having a rigid center and a more flexible front, a twin spar chassis has a long section which can flex in the center of the bike. Added to the different forces created by attaching the engine using long front engine mounts, the feel of the Ducati will be completely different to a Japanese machine. There have been a host of clues recently that Ducati are already working on an aluminium twin spar chassis for the GP11 - or possibly the GP11.1 - after a lot of pressure from Rossi and his crew chief Jeremy Burgess. A twin spar chassis could make its debut as early as Brno (though it is more probable to make its first public appearance at Valencia) with signs coming from several sources that big things are afoot at Ducati. But the twin spar may not be the panacea that Rossi (and his legion of fans) are hoping for. As team manager and test rider Vito Guareschi pointed out to a gaggle of Italian journalists and myself, building a twin spar frame means fighting the Japanese on their own territory. Both Yamaha and Honda have nearly thirty years of experience of building these frames; Ducati has absolutely none. Though a lot of the knowledge is already available, the devil - and the potential for victory - is in the detail, the final refinements giving the last couple of tenths that make the difference between being competitive and running around in 7th. Ultimately, Ducati - with a lot of pressure from Rossi and from main sponsor Marlboro - may feel they have nothing to lose, and gamble it all on an aluminium twin spar chassis. Will it help, though? Using a traditional twin spar chassis may provide more feel at the front, and it may make the riders feel a lot more comfortable on the bike. What it won't necessarily do is generate a lot of heat in the front end, which brings us to the next subject: Ducati's sacred L4 configuration. Ask anyone with even a passing interest in motorcycling what engine a Ducati uses and they will tell you without hesitation that it is a 90° V twin, also called an L twin, because the right angle between the two cylinders makes the configuration look like the letter L. The Bologna factory has been building engines in this configuration for 40 years now, since switching from smaller capacity singles to V twins at the start of the 1970s. So when Ducati decided to enter MotoGP, they naturally attempted to retain the iconic engine design which has been a key selling point for so many years. Filippo Preziosi was quick to understand that a twin would never be able to produce the horsepower needed to compete in the series, and so concentrated instead on building a four-cylinder engine, built to resemble the 90° L twin as closely as possible. Almost as an act of penance for the extra set of cylinders, the initial plan was for the Desmosedici to use a "twin pulse" or big bang firing order, with the cylinders in each bank of cylinders firing simultaneously, to make the bike sound (and behave) more like a twin. Problems handling the power such a configuration produced meant that Ducati had to switch to a "four pulse" or screamer firing order, each cylinder firing separately, but since then, the factory has oscillated between the two firing orders. The major benefit of a 90° angle between the cylinders is primary balance, where the motion of each piston in the V is balanced against the other piston. As one piston reaches top dead center, the other is in the middle of its stroke, maintaining its momentum and damping the change in kinetic energy as the first piston switches from upwards to downwards motion. The mechanical balance of the L configuration means that it does not require a large balance shaft to damp the vibrations of the engine, saving power. Balance shafts cost power to drive. But the biggest problem of the L4 configuration is its size and layout. In the modern era of MotoGP, much of the focus has been on keeping the mass of the bike as centralized as possible. The benefit of centralizing mass is that changing the setup of the bike - its weight distribution, rider position, suspension changes - can be more refined and more predictable. Knowing where all of the mass is makes it easier to calculate how to move it around to achieve the desired effect at a particular track. The main thrust of mass centralization has been in engine layouts: Suzuki's GSV-R uses a 65° V4 engine, Honda's RC212V uses a 72° V4, and Yamaha's M1 uses an inline 4 to make the engine even more compact, sacrificing a little bit of width for more centralization of mass. Behind the crankshaft, gearboxes are stacked, the rows of gears transferring power from the crankshaft to the rear wheel folded up into a V to shorten the length of the gearbox and keep the mass even closer to the engine's overall center of mass. The compact engine layouts have a secondary benefit as well: with the engine taking up less space, fuel tanks have migrated to be located underneath the rider's seat, placing that mass (which disappears as the fuel is burned off during the race) close to the center as well. A compact engine gives designers the freedom to place other heavy objects - including the rider - in a range of locations around the bike, to help them achieve whatever goals they may have set themselves. And here's where Ducati's L4 falls down. The angle between the two cylinder banks makes the engine much longer than its rivals, leaving a large space between the cylinder banks which is filled only with the throttle bodies and airbox/subframe. While the front cylinder bank protrudes through a cutout in the radiators to almost touch the front wheel, the rear cylinder bank slopes back and sits right where Yamaha has its fuel tank. The 90° angle between the cylinders forces the front cylinders to be angled forward much more than the narrower angle Honda. Visual estimates (the exact data involved is highly sensitive and impossible to obtain) suggest that the front cylinder bank of the Ducati is at 70° from the vertical, while Honda's RC212V is at just 45°. This means that the Honda engine can be moved much further forward and closer to the front wheel than the Ducati, allowing the Honda's chassis designers more freedom in placing the engine. The 18° difference in V angle between the Ducati and the Honda also equates to cylinder banks that are roughly 15% further apart, making the engine correspondingly longer. Move the Desmosedici engine further forward, and you foul the front wheel; move it further back and you drastically shorten the swingarm. The physical size of the Desmosedici engine - or rather, its rather rangy layout - means that much of the mass of the bike is further back than its rivals, with less freedom for changing weight distribution, especially at the design stage. This difficulty in moving weight distribution is one of the prime candidates for the difficulty the riders have for getting the Desmosedici's front tire up to temperature. While the bike may feel fine and the weight distribution look good on paper, the way the weight transfers under braking and acceleration is different, and this could be what is preventing the riders from getting heat into the tire. There are several major clues that this is exactly what the problem is with the Desmosedici. Throughout their struggles with the Ducati, Rossi and his vastly experienced - and multiple world championship winning - crew have experimented with some fairly drastic changes to the weight distribution. At Mugello, they raised the center of gravity by 20mm, a vast amount in a world where normally parameters are changed a millimeter at a time. At Laguna Seca, they tried another change, shifting the weight further back and leaving Rossi's bike looking more like a chopper than a racing motorcycle. 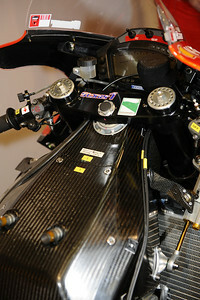 Indeed, the main rationale behind the switch from the GP11 originally fielded for the 2011 season and the heavily revised GP11.1 is that they could raise the center of mass much more without making the rear pump, a problem which the original design with the top-brace swingarm suffered from, and familiar to anyone who watched Casey Stoner coming out of corners on the GP9 and GP10 in previous years. But if the L configuration is the problem, how come it works in World Superbikes? Ducati has dominated the WSBK championship over the years, and Carlos Checa is well on his way to wrapping up another title for Ducati aboard the 1198R, fitted with a 90° L-twin engine. So how can a design that is ripping up WSBK suddenly be such a disadvantage in MotoGP? The answer to that question is to be found in the underlying cause of the MotoGP machine's problems: the tires. The World Superbike series use Pirellis as the spec tire, and the Pirellis are a completely different beast. The construction of the Pirellis is much less stiff, making generating heat in the tires a much simpler task. With a front that sticks and provides feedback, the 1198 responds perfectly, and the L twin engine is much kinder to the rear tire than the four cylinders, allowing Ducati's WSBK machine to be competitive. The Bridgestones, on the other hand, have an incredibly stiff carcass, built to handle the stresses created by Grand Prix machinery, from the powerful engines, stiff chassis and carbon brakes. Once the tires are up to temperature, they offer astounding levels of grip and feedback, allowing unbelievable performance. Outside of their optimal temperature range, they are much less forgiving, giving little feedback and making the amount of grip available difficult to judge. The L4 being used by Ducati is a prime candidate for the Desmosedici's inability to get the front Bridgestone tires up to temperature. The irony is that Ducati's early adoption of the Bridgestone tires created a highly-productive collaboration between the two parties. With a lot of input into the development direction, Bridgestone created tires that worked well with the Desmosedici. But as other teams and factories started to switch to the Bridgestones, Ducati's influence became less important, and once the spec tire was introduced, the input from Ducati became just one of the many data sources that Bridgestone used to develop the tires. With data from three Japanese factories using a conventional aluminium chassis and an engine sitting taller and further forward in the frame than the Ducati, the Desmosedici's unconventional design has become less suited to the Bridgestones. This also underlines exactly how important tires have become since the introduction of the single tire rule. By limiting the design and construction of the available tires to just two compounds (soon to be three compounds, but still), the room to modify the behavior of the bikes using the tires has completely disappeared. Right now, the key to building a competitive MotoGP machine is to understand the characteristics of the spec Bridgestone tires, and designing a motorcycle to suit them, exploiting their strengths and circumventing their weakness. This is a process that Yamaha and Honda appear to have adapted to much more quickly than Ducati has. When Filippo Preziosi suggested to Valentino Rossi that he could modify the GP12 to make it legal under this year's rules, Rossi jumped at the chance. When testing the GP12, Rossi felt the bike responded much better, and he had fewer problems with the front than he had with the 800. However, once the GP11.1 (the GP12 destroked and made legal for 2011) was introduced at Assen, the old problems returned, Rossi still left complaining of a lack of feel in the front end. How can this be? How can two identical bikes, identical except for the length of the connecting rods, the position of the crank pins and the swept volume of the engines, behave so differently? The answer lies in the different ways in which the 800 and the 1000 (or whatever capacity the GP12 happens to be) need to be ridden. The 800cc MotoGP machines all need to carry as much corner speed as possible, which means the bike is spending a lot of time at or near maximum lean. This is exactly the point where feedback from the front end is crucial, the ability to feel what the front tire is doing. The GP12, both Valentino Rossi and Nicky Hayden have said, can be ridden using the torque more; corner entry is less crucial, and the available torque gives the rider more options coming out of the corner. The bike is spending less time on its ear, in that critical zone where front end feel is so crucial. If the good news is that the 1000 will be spending less time in its weakest area, the bad news is that the problem is still there. The GP12 suffers from a lack of front end feel as much as the GP11 or GP11.1, it's just that it will be easier to ride around it. The new chassis, the bigger engine, will not magically cure the Ducati's ills. The GP12 may not suffer as badly as the GP11, but it will still have problems contending with the Honda and the Yamaha. While the whole world and their cousin-in-law concentrate on the Ducati's use of carbon fiber and their minimalistic subframe which functions as a chassis, the problem may lie elsewhere. If the rumors are true, an aluminium twin spar frame could soon be on its way to the Ducati garage, possibly as early as Brno. All of Bologna, all of Tavullia, all of the Valentino Rossi - and indeed, Nicky Hayden - fans around the world will be praying that this is the solution, and Rossi can start to compete once again. If it doesn't, then Ducati is in an even bigger hole than they are now. From all that I have learned in speaking to engineers - or rather, listening, and then shamelessly stealing their ideas, for which they have my eternal gratitude - Ducati's problems are not fundamentally down to their minimalistic chassis design, and probably only partially due to their use of carbon fiber. The concept of combining the two - a small subframe made of carbon fiber, tuned to provided optimum flex - is basically sound, though it clearly has a few problems. The biggest being the feedback provided by carbon fiber, is fundamentally and confusingly different from that provided by an aluminium twin spar design. If riders can learn to understand the information being returned from the carbon fiber chassis, and the engineers can design the CF to produce the desired feedback, then this avenue could provide options well worth exploring. It may also offer Ducati's best hope of competing, as any move to use a twin spar chassis leaves them short of the twenty-odd years of experience the Japanese manufacturers already have. The much bigger problem, in my view, is the layout of the engine. It is physically large, the 90° L4 layout making the engine long, and placing the cylinder banks in awkward locations when packaging a racing motorcycle. The size and shape of the engine make compromises on layout inevitable, and precisely these compromises are what are preventing the Ducati from generating the necessary load in the ultra-stiff front Bridgestone tire, and leaving the front end of the bike feeling vague. With no confidence in the front end, neither Valentino Rossi nor Nicky Hayden - nor indeed any of the satellite Ducati riders - can push the bike to the extent needed to be competitive. Abandoning the L would be the biggest step Ducati could make towards becoming competitive again. It would open up avenues which the current layout makes it impossible to explore. The weight distribution would be much more flexible, giving Rossi, Burgess and co. more options to explore. A more compact V or even an inline 4 layout could turn around Ducati's prospects. Of course, this means abandoning forty years of history, and a layout which has become part of the Ducati legend. If it were to fail, Ducati would have lost both its reputation as a manufacturer of fast motorcycles, and sacrificed a key part of its iconic brand identity. If it succeeds, the question is whether the Ducatisti will feel that sacrificing their heritage is worth the return in competitiveness. It all boils down to two simple questions. Is Valentino Rossi's failure on the Ducati more harmful to Rossi or to Ducati? And would changing Ducati's design philosophy - potentially abandoning the iconic L configuration - hurt Ducati's long-term prospects more than allowing Rossi to continue failing, and risk losing him to another manufacturer? To my mind, there is no debate. Ducati's exclusivity is built to a large extent on sporting success. Failure in MotoGP is simply not an option, the worst of all possible worlds. If Ducati is to exploit the strength of their own brand - and especially the selling power of Valentino Rossi - they need Rossi to be winning, or at least on the podium week in and week out. The MotoGP bikes are seen as so far removed from Ducati's street machines that the engine configuration - or for that matter, the chassis layout - is irrelevant. Using an L twin may be a big deal for Ducati's World Superbike effort, as there they are racing the machines that they are trying to sell. But exactly how many degrees apart the Desmosedici GP11's cylinders are has no bearing on the purchasing decisions of prospective Ducati customers. Having Rossi be successful is. If Rossi fails, Ducati fails, leaving them either to find another rider who can ride around the Desmosedici's problems, or pull out of MotoGP altogether and focus on World Superbikes. That final scenario is all too realistic. Ducati has survived in MotoGP thanks to the generosity of Marlboro's parent company Phillip Morris. Hiring Valentino Rossi is exactly the kind of high-profile coup that the tobacco giant loves. Having him fail miserably is exactly the kind of thing that Phillip Morris hates. If Marlboro believes the Ducati project is fundamentally flawed and that Ducati Corse is unwilling or unable to fix it, they will be gone, off to find another avenue for the promotion of their brand. With Yamaha without a title sponsor, and a long history with the Marlboro brand, Phillip Morris should have no trouble in finding another partner in MotoGP. merci, effectivement tout les éléments sont pesés. Valentino , mon idole !! si quelqu'un veut un autographe ..
Melandri à un nouveau copain !! C'est quoi ta question que les truffes ont posés ad' ??? "Au milieu en haut prés des té inférieurs pour que quand y ce vide il soit plus bas"
Déja qu'il plume Spies , Simoncelli et Dovi et aprés on verra si il peut s'attaquer au cadors. Pour les CRT depuis le début je ne comprends pas bien quoi ça va servir d'engager, une moto, un team, des frais donc, avec comme seul certitude de ne jamais monter sur un podium !!!! Sauf truc extraordinaire genre un avion qui s'écrase sur les premières lignes, non sans blague? Batta le disait mieux que moi en répondant a la question de AdD. Autre question : Est-ce qu'il y a un endroit ou une SBK et une moto GP se sont reellements affrontées sur un même circuit dans les mêmes conditions? Pour essayer d'imaginer ce que sera une CRT en terme de performance fasse a une moto gp? Quelle sponsor voudra mettre des ronds la dedans ? Y a pas une crise quelque part ? Quoi Hoppkins ? Il s'est blessé ?